Snuggled in a valley, Banyan Tree Ringha is a truly idyllic Chinese experience. Think luxe oriental decor set amongst a farm-stay setting. Snuggled at the bottom of the unspoilt Ringha Valley beside a roaring mountain stream in far northern Yunnan, at 3200 metres, this Banyan Tree could offer some of the world’s highest and most remote luxury. Flanking the outskirts of a traditional ethnic-Tibetan village, which sits plump under imposing snow-white peaks, 32 traditional-style stone farmhouses have been assembled along the foot of the valley. The spacious rooms are rich in dark woods, hand beaten copper and red trimmings. 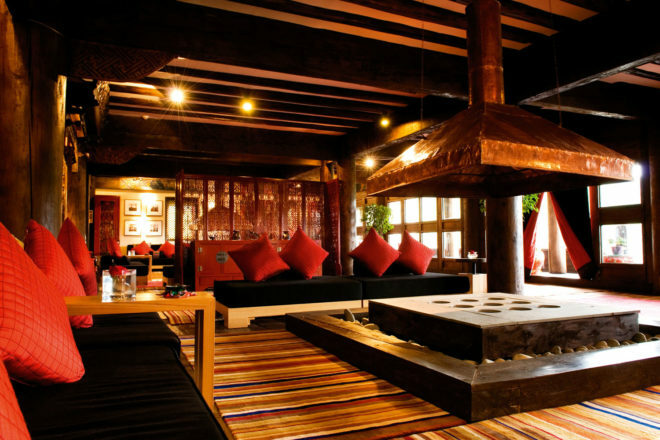 Buddhist thangkas, decorative woollen carpets, handcrafted wooden bathtubs, private terraces and fire places – for frigid winter nights – complete the traditional look. Established like a luxurious farm stay horses, pigs, yaks and cows roam freely around the area. Take walks in the surrounding hills, following the tracks that nomads use to take their yaks into the summer pastures, venture to the ancient Songzanlin Monastery, or sit back on your terrace and just consider the tranquil surroundings.